Clichés have their value, according to that genius of unique songwriting, Paul Simon. "After a phrase that conveys a complex image or uses unusual words, I often make the next phrase very familiar—even a cliché. It takes listeners time to absorb a dense phrase, so following it with something simple, or just 'lie-la-lie,' lets the impact of the phrase get through." Also, strategic placement can add value: "A cliché when it's not expected can break your heart." 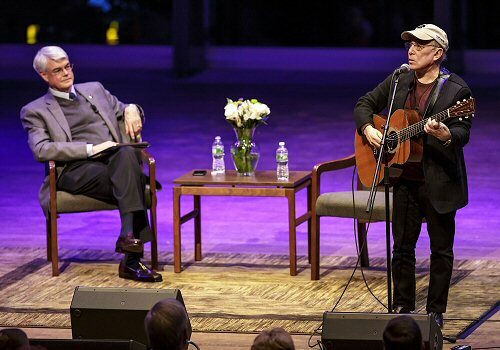 Paul Simon offers an impromptu performance during his interview with Phil Glotzbach. Simon, the 16-time Grammy winner who helped create the soundtrack of American life for the past six decades, was sharing insights in a songwriting masterclass for a group of music and English students, with whom he set a vibe that was relaxed yet intensive, open yet intimate. When a student began her question with "So, I was wondering..." he interjected, "See? You might be able to use that phrase—it's obviously natural for you," and then said, "Sorry, what was your question?" When a white male asked how a white male can incorporate other cultures' material without "appropriating" it (a charge leveled at Simon's Graceland project with South African musicians), the answer was: "You can't help but be influenced by what you love. Unless you do a bad imitation, which could be seen as offensive for denigrating the original, don't worry about it. Use what seems valid for you and take the criticism. All that's required is to respect what people say and do your own art." What's important, he added, is to "investigate deeply. It's invigorating to discover something new to incorporate into your thinking. As you know, everything is connected to everything, in music and in life." After the class, Simon took the Zankel stage, with Skidmore President Philip Glotzbach as interviewer, for "A Conversation about a Musical Life." (A few days before this event, students, faculty and staff had reserved every seat in the concert hall in less than two hours.) Both events were free of charge, and on stage Simon surprised the crowd of nearly 600 with acoustic performances of "Questions for the Angels" and "American Tune." Also a philanthropist, Paul Simon co-founded the Children's Health Fund, providing mobile medical care to low-income children and their families around the United States, and has raised funds for other causes from Autism Speaks to Tibet House. His net proceeds from this past June's U.S. tour went to the Half-Earth Project to stop the species extinction crisis by conserving half the planet's lands and oceans. He told the Skidmore crowd, "We are in a battle for survival. With the ecosystem collapsing and with climate change, we could very well be facing a planetary extinction on the level of what happened to the dinosaurs." Noting scientists' remarks that Earth has the potential to become a paradise or a wasteland, he said, "I won't see the answer to that question. I just had my 76th birthday. But it affects my children and grandchildren." His call to action: "Everybody has to join the fight. I perform and give the money—that's what I can do. You all have to find what you can do." He also told the audience of his earliest influences, such as Elvis Presley, Johnny Cash, Chuck Berry and, perhaps most strongly, the Everly Brothers. He recalled taking those inspirations along when he and Art Garfunkel—neither yet 16 years old—traveled from Queens to appear on American Bandstand. And he told of other gigs with college chum Carole King, of the 1950s when "audiences that were used to hearing 'How Much is that Doggie in the Window'" got to hear the likes of Ray Charles on mainstream radio, and of his time in England learning folk guitar (he admired Joan Baez and Bob Dylan) and hearing ska from Jamaican artists before reggae became popular. For the students, Simon played a CD of a work in progress: a new version of his 2000 original "Darling Lorraine." Calling it "a song's song—all about the story"—he said he didn't know where it was going while he was first writing it, but when he came up with the line "I'm sick to death of you," he recalled, "I suddenly realized, uh-oh, she's going to die! Now I had my story, and the rest was just editing." He reminded students that "lyrics, no matter how enriched the language or imagery, are not the same as poetry, because the words work with music." And how does he start devising new music? He grabbed his guitar to demonstrate, singing a continuous note while strumming a few chords that all carried that note. By trying different chord progressions, and then noodling the same way with a different sung note, he could find the basics of a melody. "Once in a while, I'm just the channel and the song flows. It's great when that happens." In "being connected to the universe and having things flow out almost effortlessly," he has learned, serotonin and dopamine produces a feeling of well-being, "and suddenly you say, 'Gee, I can't believe it's 2 a.m.' You're surprised by it; you're the audience for your own brain." This interest in neuroscience also flavors his joy in hearing "young players who are virtuosos. A beautiful, compelling melody can move you to tears and you don't know why. It's fascinating." Simon had a tip about melody for the students too. When he listens to his playbacks during editing, he said, "Ear goes to irritant—all that stands out are the moments that make me wince." The first remedy is "to simply remove the irritant. Maybe you can replace it with something better, or maybe removing it is the solution." Another important tip: "If you keep editing and nothing is working, don't keep trying, because it's the premise that's the problem." With his children also musicians, perhaps it's no wonder that Simon was so authentic and practical in engaging the young Skidmore musicians and writers. After 90 minutes, and despite his tight itinerary, he lingered in the classroom with a ring of rapt students around him and talked more—for instance, about consistency vs diversity in a body of work, he said, "You can't only keep mining something; you gotta feed it too." Finally trailing out of the empty room, a student told her companion, "That was the most exciting thing ever!"